We have often been asked about how Regal Weddings have become synonymous with Udaipur and we never hesitate to share this continuing saga of a success-story that has made Udaipur into India’s most preferred wedding destination. Udaipur’s Shiv Niwas Palace, Fateh Prakash Palace and Jagmandir Island Palace are unique palace-hotels of India. This is a matter of historical fact not opinion. The uniqueness is derived from its grand architecture, its luxurious suites and spacious courtyards. But the challenge for us, at HRH Group of Hotels, is to maintain and keep alive its original character. These palaces are where royal families lived and entertained their guests for centuries; that is why these palaces share a distinctive character and guests here are able to ‘Experience the Original in the Abode of Kings’. There are unique heritage-venues that have been developed for guests to plan out their wedding ceremonies, corporate celebrations or music and dance performances. HRH Group is making possible these unique ‘Regal Experiences’: it truly is our USP. Today Jagmandir Island Palace is not only the most exclusive heritage venue in India for wedding ceremonies and celebrations; it has emerged as a complete destination in itself: a quiet bar where even a backpacker can chill out with a beer, to ‘The Darikhana’ restaurant where a fine dining experience can be offered to high-end business travellers. The Panghat Spa has some of the best-trained therapists helping guests de-stress and rejuvenate themselves. The spa provides authentic ayurvedic and regal treatments through experienced therapists and guests prefer to spend the hours at the spa, taking a break and enjoying a lunch in The Courtyard. The privacy is complete. We have been making these investments at HRH Group only to ensure that our guests get world-class service in an ambience that is truly authentic and unique. We are delighted to share the news that HRH Group is participating in the forthcoming Destination Wedding Planners Congress 2014 in Athens. We are confident that the world’s top wedding planners will see immense value in the investment which HRH Group has made to make Udaipur into India’s most preferred wedding destination. These top wedding planners of the world will soon be bringing their clientele to Udaipur. In the years ahead, there would be incremental business development for HRH Group and Udaipur through participation in premium events like the Destination Wedding Planners Congress in Athens. In the 400-year-old history of Jagmandir Island Palace, HRH Group has sensitively utilized the island-palace for 21st century audiences. And just to tell you how well-appreciated Jagmandir is: Shakira, the global celebrity, recently tweeted that “a visit to India is incomplete without a visit to Udaipur.” She had performed at Jagmandir Island Palace for an exclusive private dinner. Over the last two decades, the regal venues of HRH Group have been the most sought-after for weddings, family celebrations and corporate events. 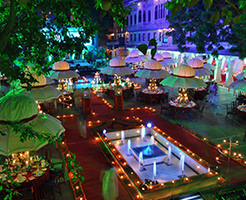 Whether it is a high-profile conference at The Sabhagaar, The Durbar Hall or fun-filled wedding ceremonies at The Zenana Mahal or Manek Chowk, HRH Group has been able to meet and surpass guest expectations with the range of cuisine, decor and arrangements that include line-up of vintage cars and horsemen. It’s been a great learning experience for us too. We’ve understood the diverse requirements of our guests. And it’s a real challenge to meet it every time, to make it so special and memorable for them. I am happy to say that our efforts have been well-appreciated by event planners, guests and corporates alike, who are often taken by surprise with the degree of professionalism and warmth they experience here.. Through the year, the regal festivals at the City Palace provide a window to the past for guests who want to witness an authentic Indian festival. At Holika Dahan in March-April, Ashwa Poojan in October and Kartik Poornima during the full-moon night of November, it’s a spectacle of ancient religious rituals and colours that guests can get to experience. The HRH Group organizes music and dance soirees, along with sumptuous buffets and sit-down dinners, for guests to relish this cultural extravaganza. For guests, it becomes a feast for the senses…They remember the events and holidays in Udaipur for years to come. Preserving luxury: For us, luxury and excellence get enmeshed together in ‘living heritage’, the idea we have been espousing and sharing with global and Indian audiences. Many feel that simply preserving an old palace is a great achievement. No doubt, it may be. But it is more important to keep ‘alive’ its ways of life, protocols and etiquette, rituals and festivals of our Royal past. Preservation is not just a brick-and-mortar story; it is also the drive to preserve and nurture excellence, the intangibles that require equal, if not greater, effort of preservation. In the palace-hotels, museums and collections in Udaipur, guests experience traditions of the Royal past which have been made contemporary and relevant for global audiences. The regal experiences in Udaipur are luxuriously diverse: from visits to The Vintage and Classic Car Collection for auto-enthusiasts to sipping wine at Palki Khana, the European-style cafe at Manek Chowk after the son et lumiere show tracing the 1400-year old history of the House of Mewar. Guests are able to absorb the ‘living heritage’ of Mewar as they experience these fascinating facets of Royal Rajasthan. We want Udaipur of the twenty-first century to evolve as a centre of excellence, not just in luxury heritage hospitality but also the arts, music, sports, education and spirituality. In July 2009, Travel+Leisure voted Udaipur as the ‘best city in the world to visit’, clearly a landmark achievement for all stakeholders: a testimony to the holistic, comprehensive development of the city, growth and enrichment of its local economy and generating greater pride in traditional professions, crafts and culture.